The new Intense Carbine 29er weighs in at 30.8 pounds size medium with DMR Vault pedals at 420 grams a pair. 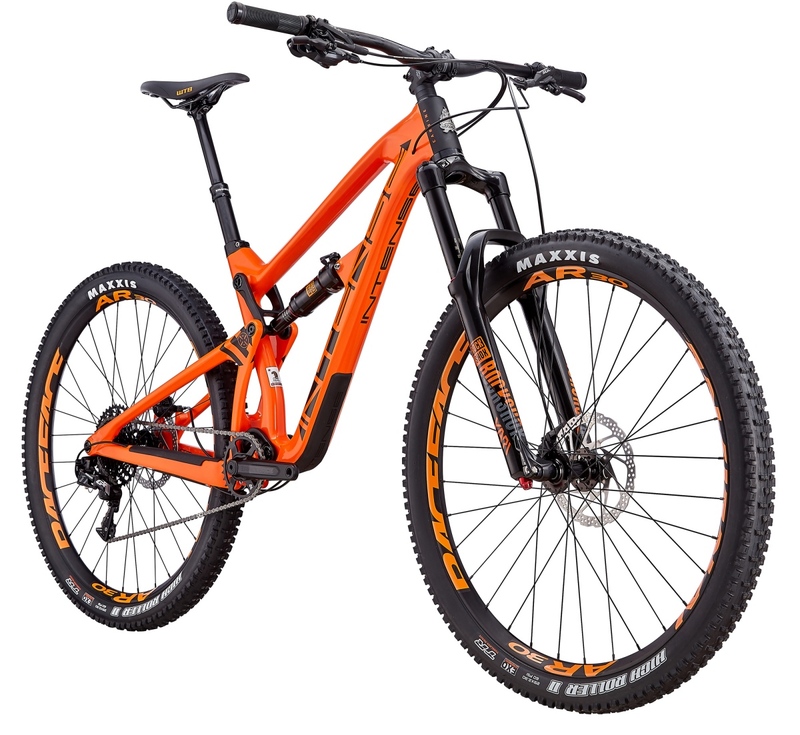 The new Intense Carbine is a 155mm/160mm travel 29er that follows the trend of seeking more speed, whether going uphill or downhill. 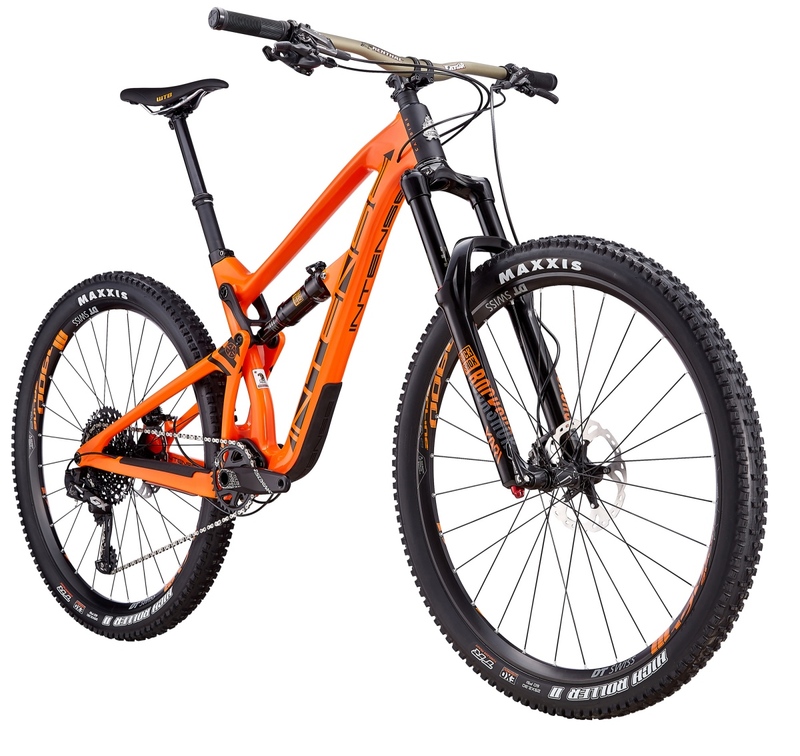 It is the successor to Intense’s Carbine 29C that had 140mm rear travel and 160mm up front. This new rig has a slacker head angle at 66 degrees (vs 67) and a longer reach at 431mm (medium) vs 416mm. Seat angle has also been steepened from 72 degrees to 74 for better seated pedaling performance. Chainstay length was also adjusted, shrinking from 451mm to 445mm despite the longer rear travel. The new BB height at 348mm, which is only 1mm off than outgoing version. 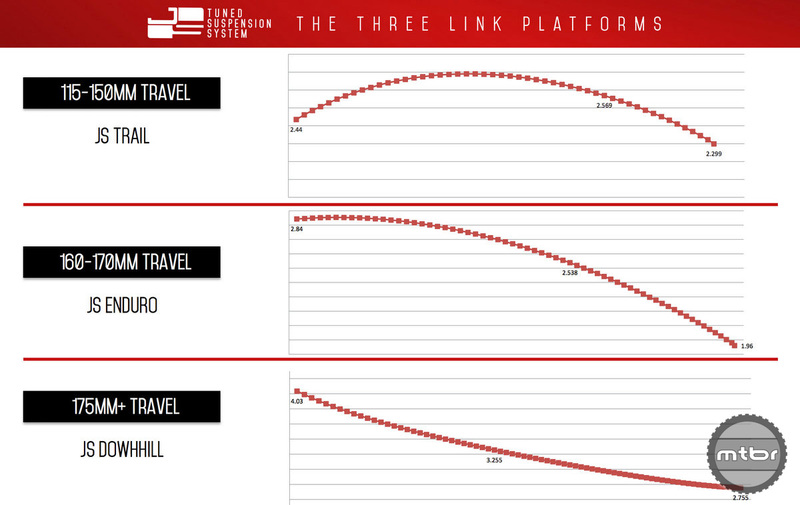 But because this has 20mm more travel, this bike sits lower at sag and at full travel. 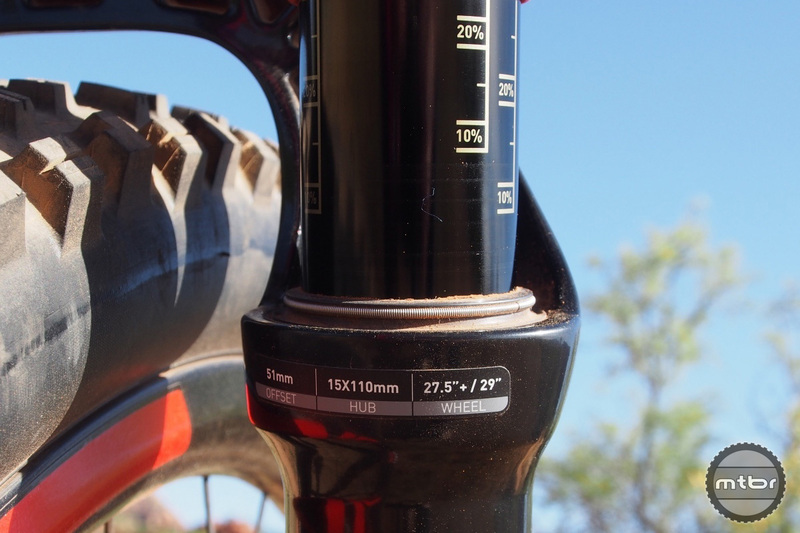 Wheelbase grows from 1168mm to 1205 because of the slacker head angle and longer travel. Intense Carbine 29er feels small in the air. Dramatically, seat tube length has been decreased from 457mm to 418mm (size medium) to allow the use of longer dropper posts. Coveted 150mm drop is not a problem for this 5’8″ test rider and we still had 10mm of exposed post left. Bottom line, it’s a highly capable bike, ready to take on the likes of Trek’s Slash, the Evil Wreckoning, Specialized Enduro 29, and so on. 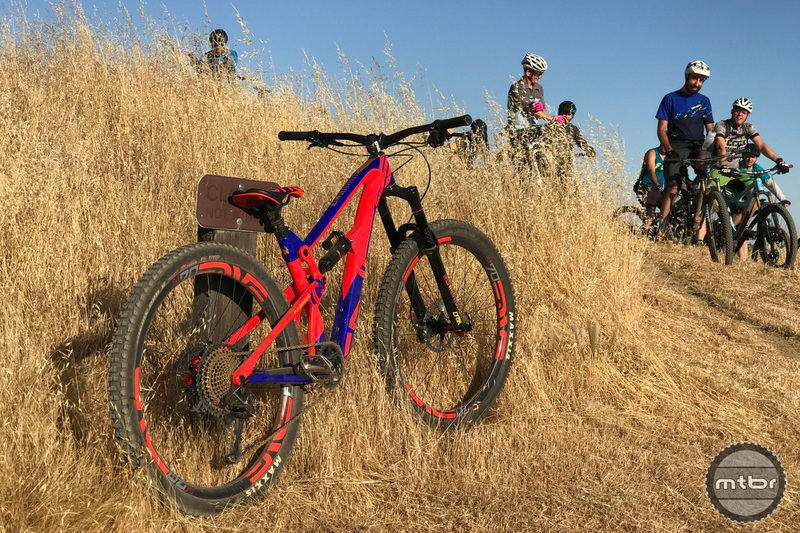 The build Mtbr tested was the top end $10,400 model, but there are five models, including $3999 for a 1×11 Foundation build. The new Intense Carbine 29er wheel to wheel with the previous two generations, a 140mm 29er and 150mm 27.5. 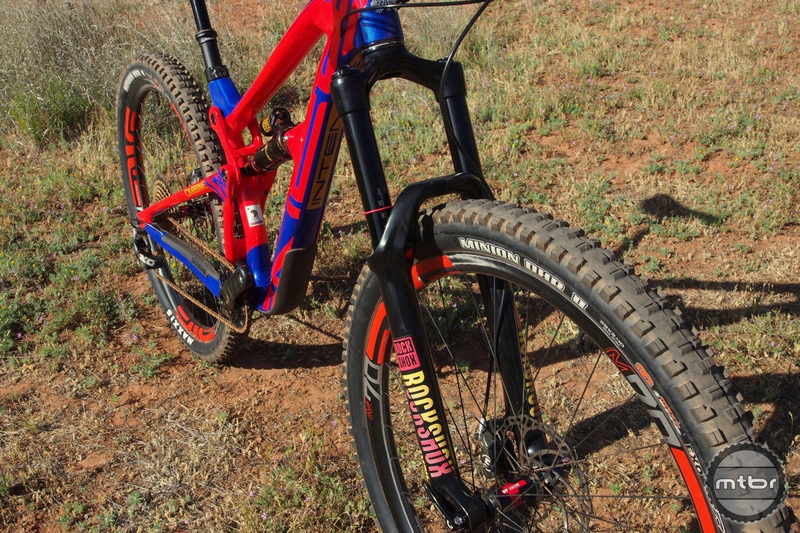 We got to ride this bike in two locales, the techy trails of Sedona, Arizona, and the fast rowdy dirt around Santa Cruz, California. On the HiLine trail in Sedona the bike was a confidence-inspiring bomber, the steep, chunky segments no problem and cleared without much drama. At higher speeds, the bike tracked well and was very stable while holding a line extremely well. 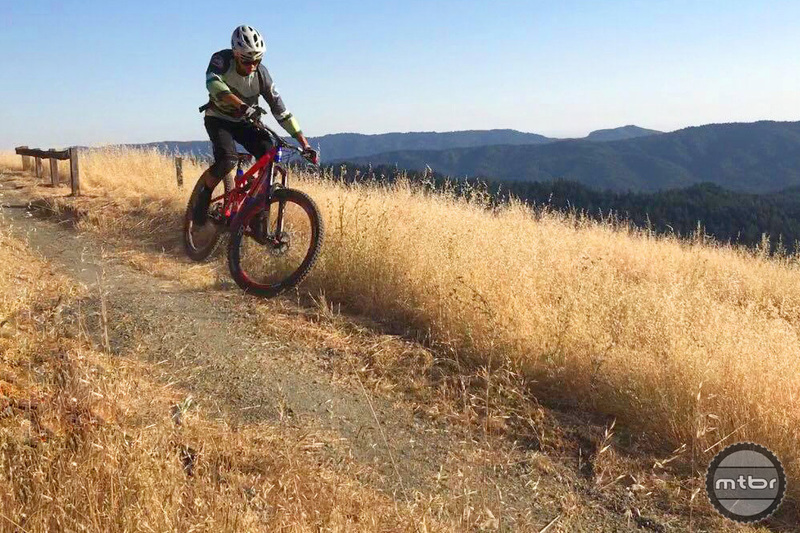 The Intense Carbine 29er leading the charge on Mtbr’s weekly group ride. At Demo Forest near Santa Cruz, we attacked the Flow Trail and got a PR right away after a 6-month lay-off due to a storm shutdown. The bike rolled well and kept speed entering and exiting each berm with confidence. It was fairly easy to pump the bike through the rollers with the 150mm drop courtesy of the Fox Transfer dropper post. We moved on to Braille Trail and again attacked the trail. Without fully knowing the condition ahead of us, we felt confident that we could adjust to any surprises on the fly. And this really is the advantage of a big bike to the normal trail rider. It allows one to get rowdy on occasion without too much weight penalty. The normal hand fatigue we get on the high-speed straightaways was not an issue with all that travel. Indeed, the suspension is supple and controlled. It never dove or bobbed, and had good movement for small bumps. We never bottomed it out in these sessions. At 30 pounds with efficient suspension, the bike motored up hills with little issue. 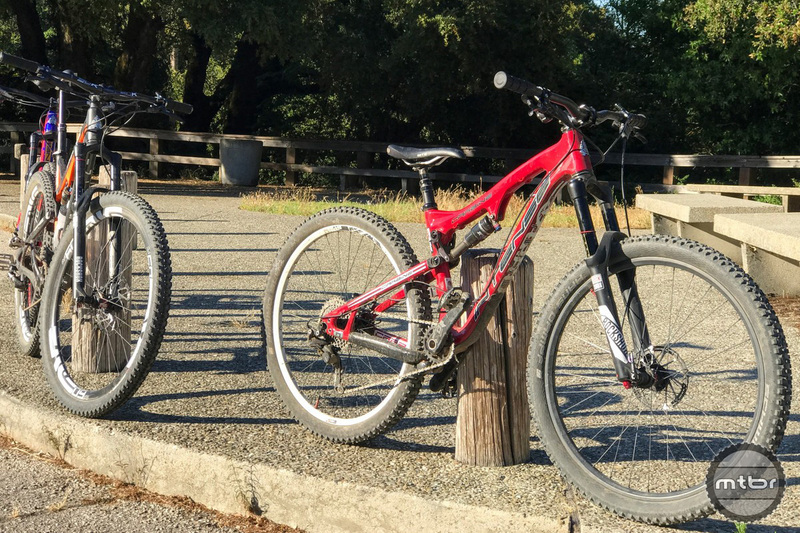 In classic 29er form, it kept its speed well on climbs and rollers even with the new, meaty Maxxis Minion tires front and rear. But on slow, techy climbs, the front end was a bit of a handful to keep down and planted. We found the stack a bit high with so much wheel, travel, and riser bar. The bike wandered a bit unless we kept our weight very far forward. On very chunky climbs, the bike did fine, but it was not as active as other suspensions we’ve been using like the DW-Link on Pivot’s Mach 5.5 or Switchblade. And the wheelbase at 1205mm was quite a bit to throw around on tight trails. 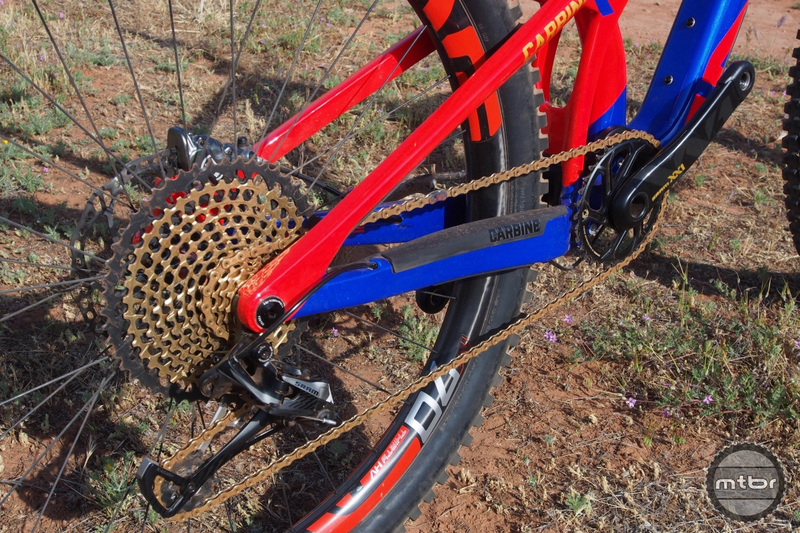 The Intense Carbine 29er is one of the few bikes that truly matches the gold SRAM Eagle. This bike is very capable and we really just had to trust and let it go. On the medium size, stack was high and we really had to lean forward on high speed corners to get it to rail. On switchbacks and tight turns we had to use a lot of body English and move all over the bike to throw it around. Once we got the hang of that, the bike rallied. In the air, the bike did well, the big dropper post and low top tube making the bike fairly nimble in the air. 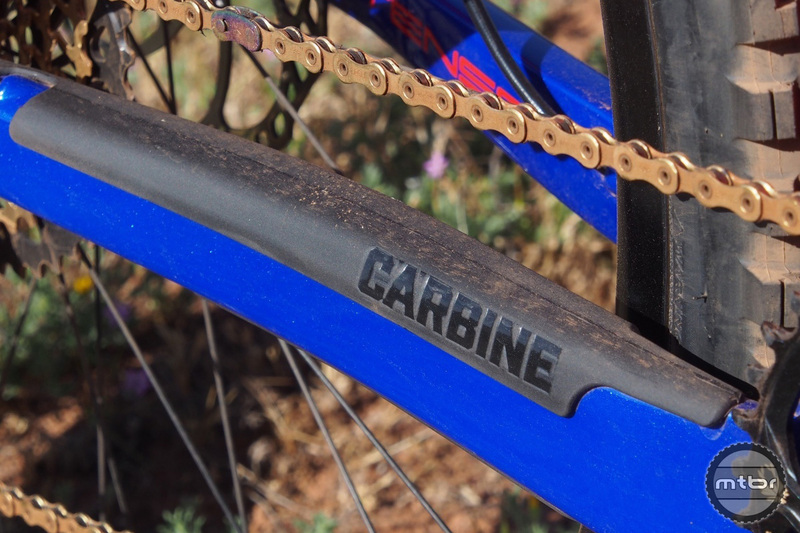 The new Intense Carbine 29er’s head angle is 66 degrees compared to the outgoing version’s 67. Everyone who saw the bike said, “wow.” Our build had the loud paint job and though not for everyone, most agreed that it was extremely well done. For those who can sport a ‘look at me’ paint job, there are few that are as well executed as this one. And each build level comes in two colorways, so more tame options are available. 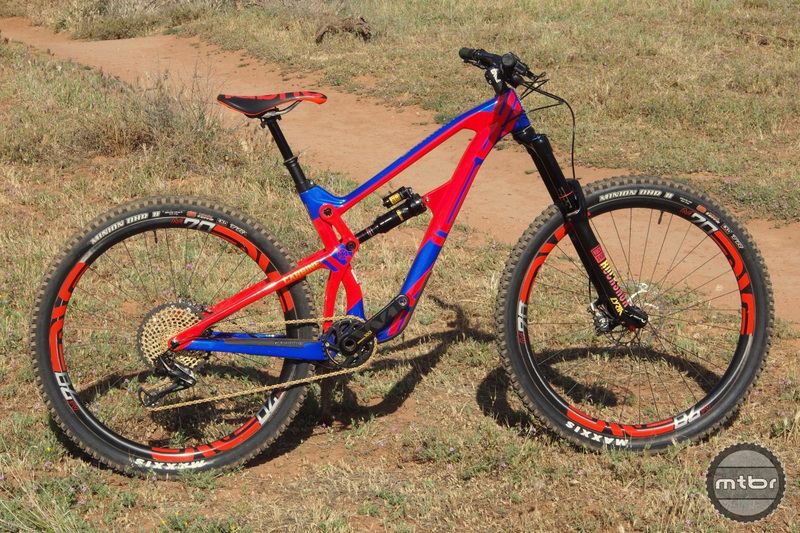 The top-end Intense Carbine 29er sports a metric Monarch Super Deluxe shock. This model is a major effort by Intense and it shows. In a nutshell, everything is dialed. The ENVE bar and stem seem to be the perfect length and width. 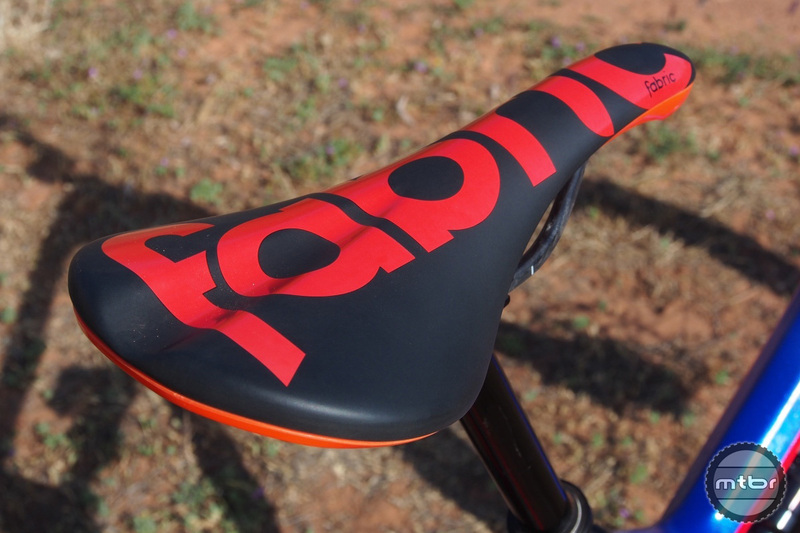 Saddle is the comfortable Fabric carbon-railed version with matching pantone paint color. The Fox 150mm dropper, Maxxis Minion tires, and RockShox suspension with metric rear are all best of breed. The frame has an extra short seat tube to accommodate the longest dropper posts. Inside, the frame is internal cable routing sheaths to simplify installation and eliminate noise during aggressive riding. A frame guard downtube guards meets the cables exit port with guides that clamp the cables down with zip ties and protect from rubbing. And the paint scheme matches the gold-colored SRAM Eagle cassette and chain. 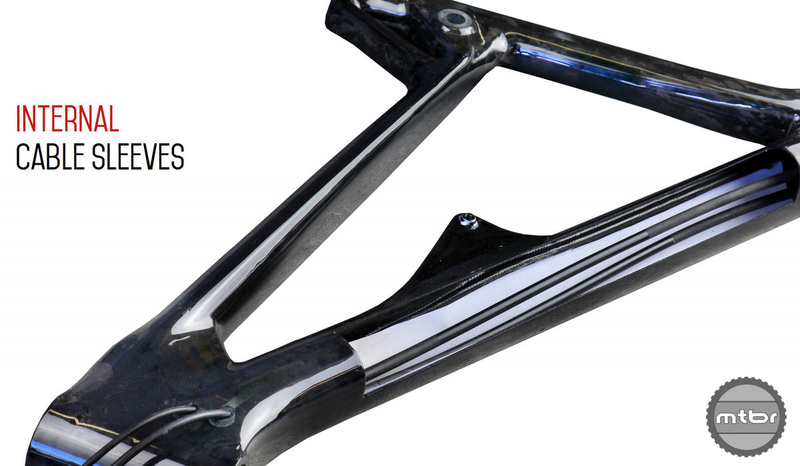 The frame features a very smart downtube protector with integrated cable guides. There are five builds available and although our test model surpassed the $10,000 mark, an $8000 model with carbon wheels offers a little better bling/dollar balance. Looking down the line-up, the $3999 is really quite attractive and does not look like a budget build at all. 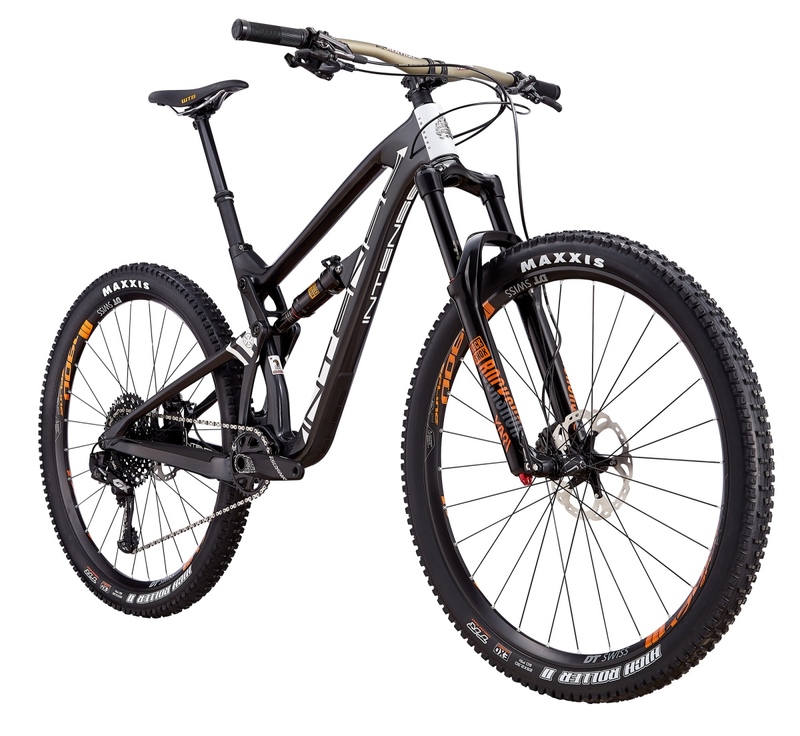 It is quite a looker still and features a good 1×11 GX/NX and Race Face 150mm dropper post. 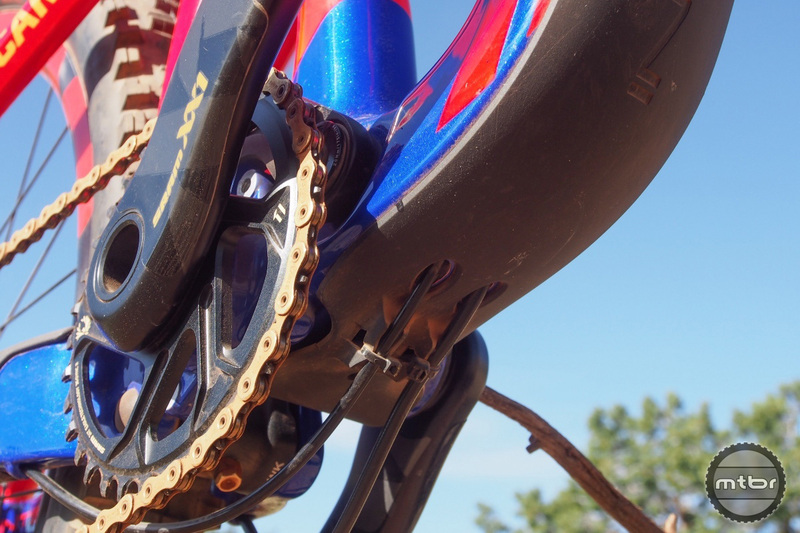 The Intense Carbine 29er is one of the few bikes that matches the gold SRAM Eagle. Stayed tuned to Mtbr as we’ll soon pit this new bike against the best long travel 29ers and see how it fares. 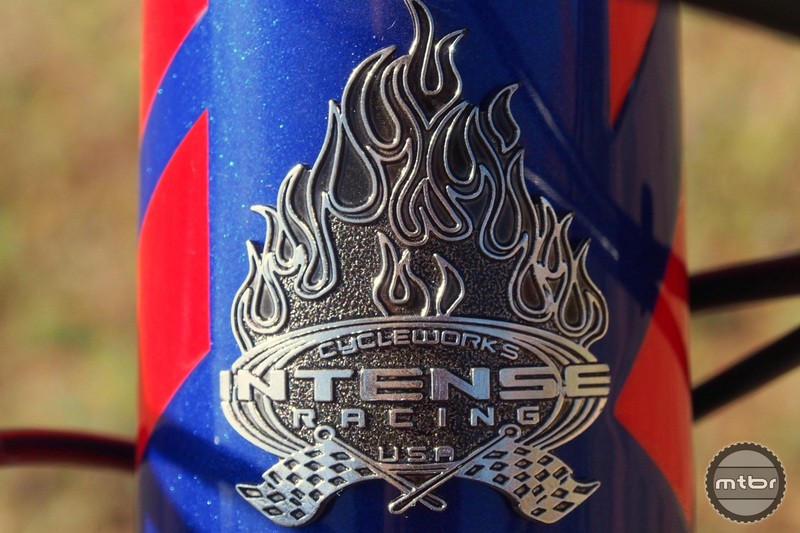 In the meantime, for more information, visit www.intensecycles.com. 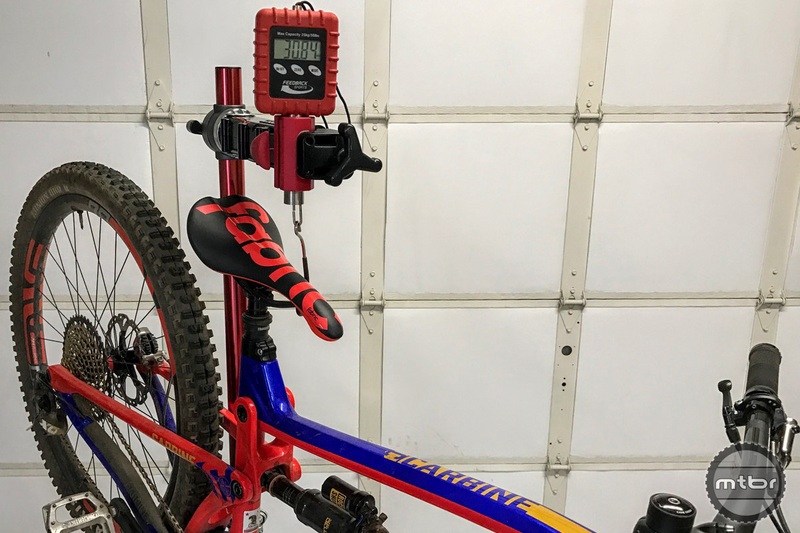 Intense Carbine 29er weighs in at 30.84 with DMR Vault pedals at 420 grams a pair. Intense Carbine 29er is one of the few bikes that matches the gold SRAM Eagle. 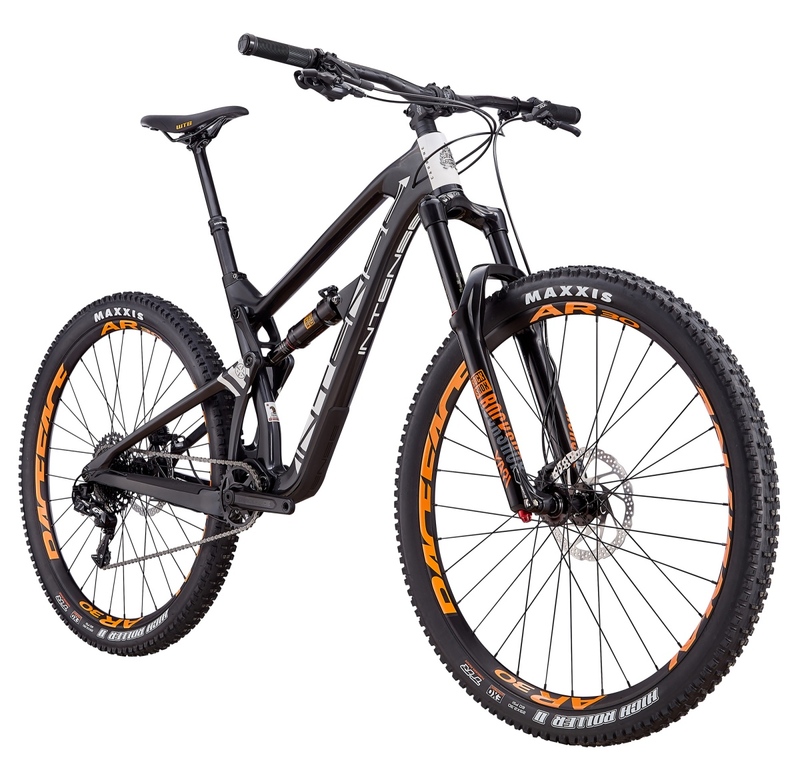 Intense Carbine 29er with the increasingly popular Fabric saddle. 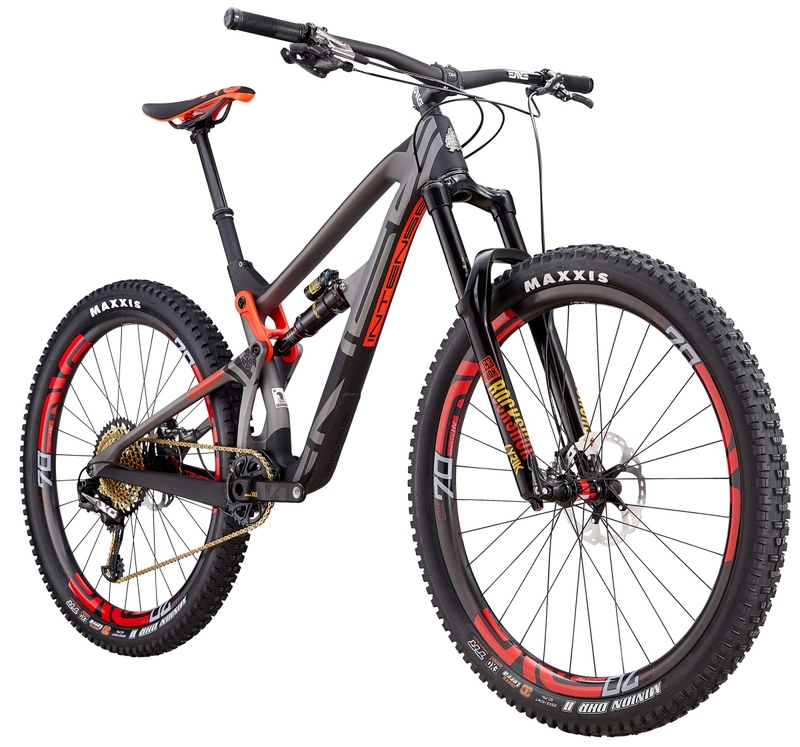 Intense Carbine 29er with a Metric Monarch Super Deluxe shock. Features a very smart downtube protector with integrated cable guides. Intense Carbine 29er with integrated chainstay protector. 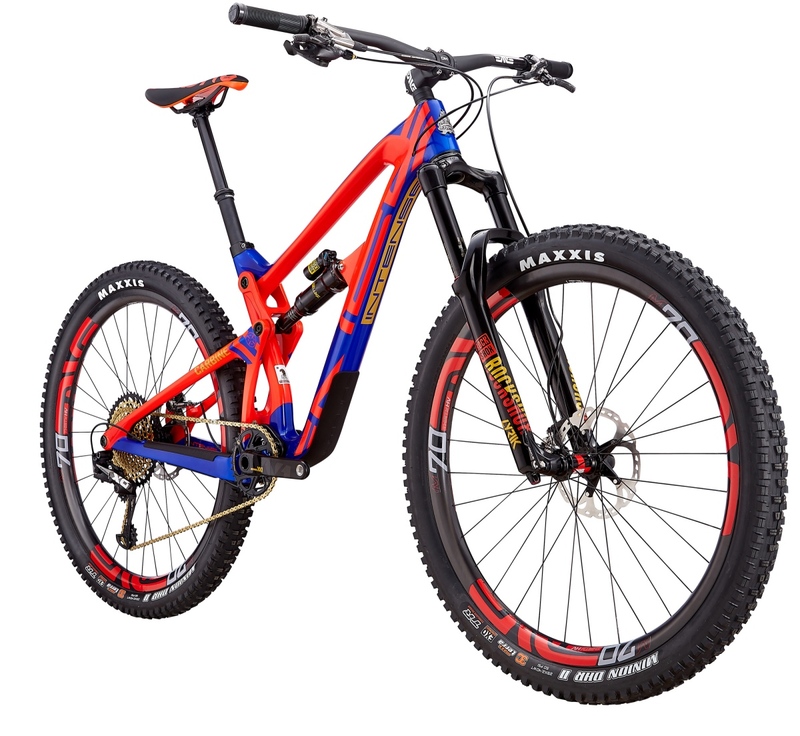 Intense Carbine 29er with Minion front and rear. 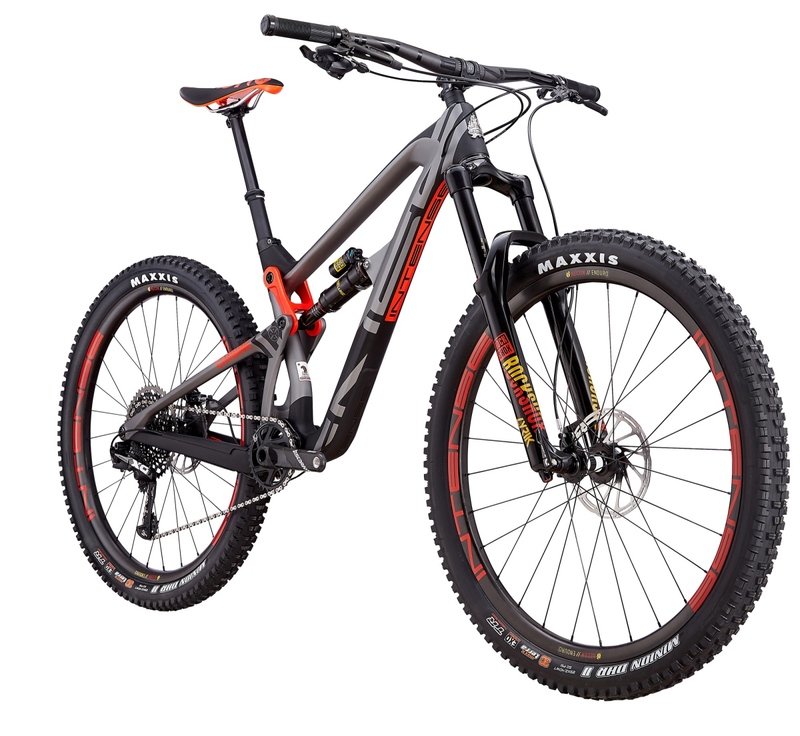 Intense Carbine 29er were tried with Magura MT7 brakes to compare to the stock SRAM Guides. Intense Carbine 29er with familiar head badge with impressive lineage. Intense Carbine 29er with a stubby ENVE stem and wide bar. 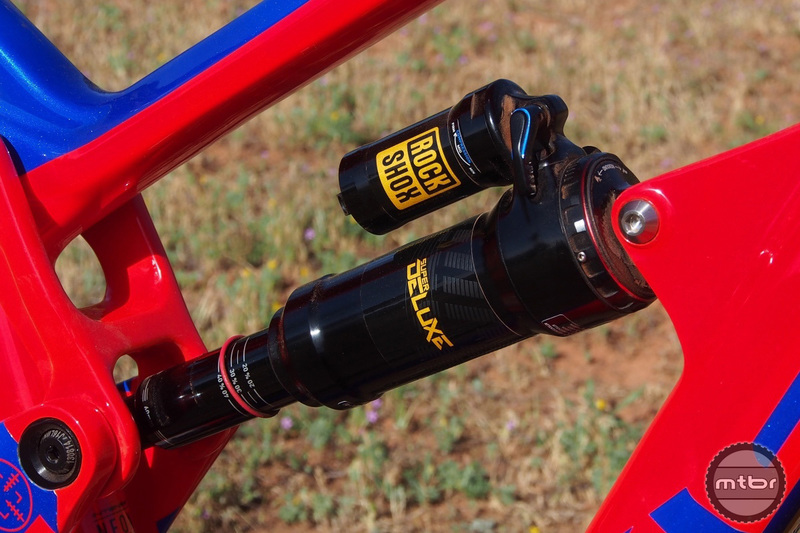 Intense Carbine 29er with 160mm RockShox Lyric. Intense Carbine 29er is difficult to camouflage in any setting. 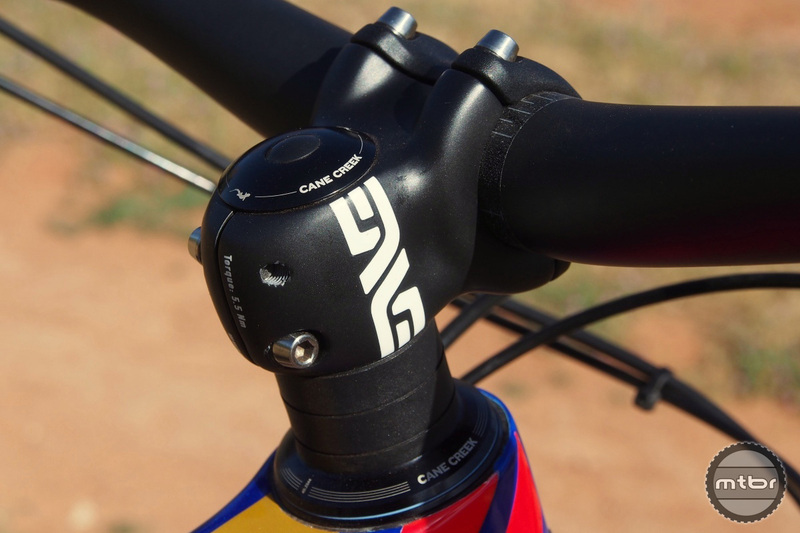 Intense Carbine 29er head angle is 66mm compared to the outgoing version’s 67. 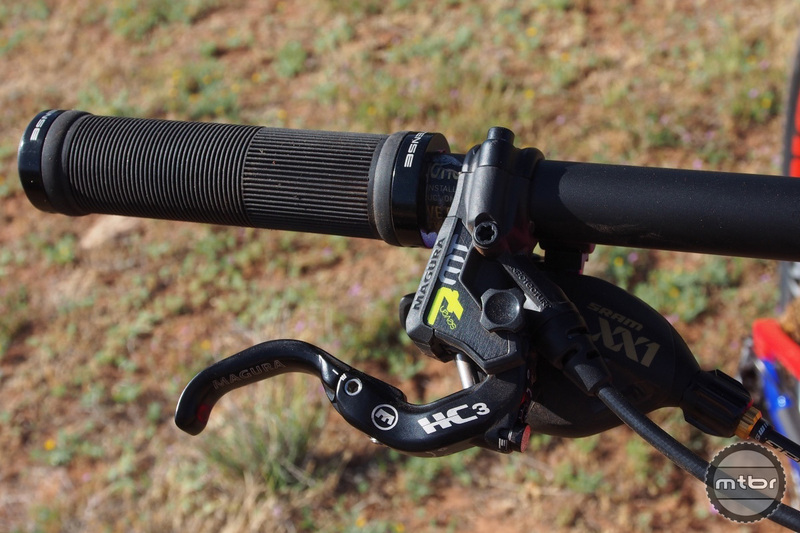 Intense Carbine 27.5 version with a 150mm of travel sported a 67 degree head angle. 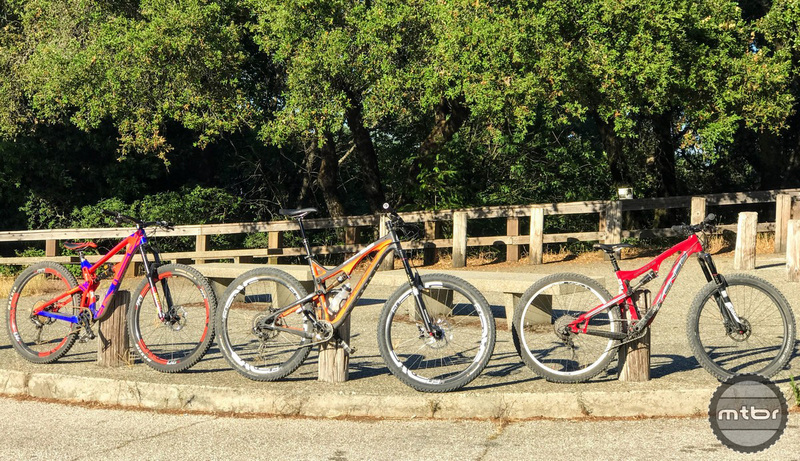 Intense Carbine 29er on the with its previous two generations. 140mm rear 29er and 150mm 27.5. 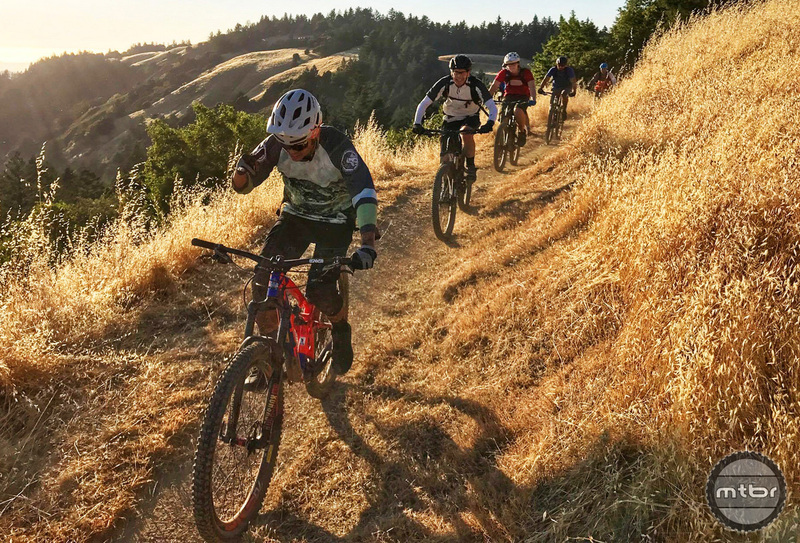 Intense Carbine 29er leading the charge on the weekly group ride. 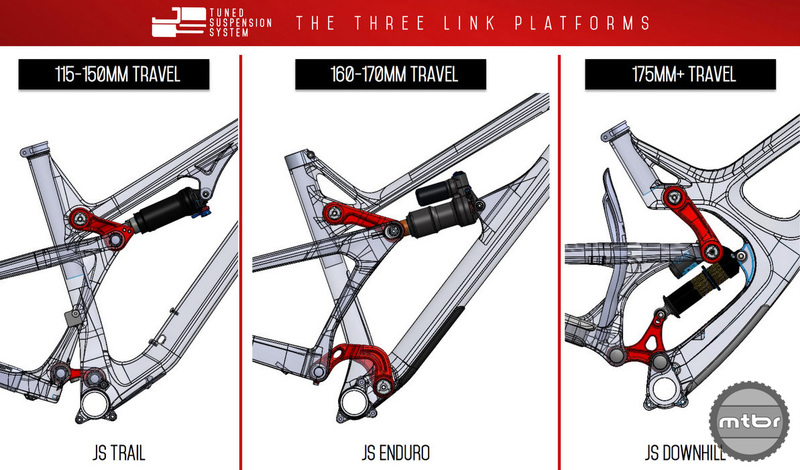 Intense Carbine 29er features the middle JS Tuned design. Features a linear suspension curve. Details like internal cable sleeves are now part of the system. Hmm… When did that become a trend? I’ve got this revolutionary idea for you. How about you test the lower spec regular versions of new bikes and leave the silly million dollar models alone?! 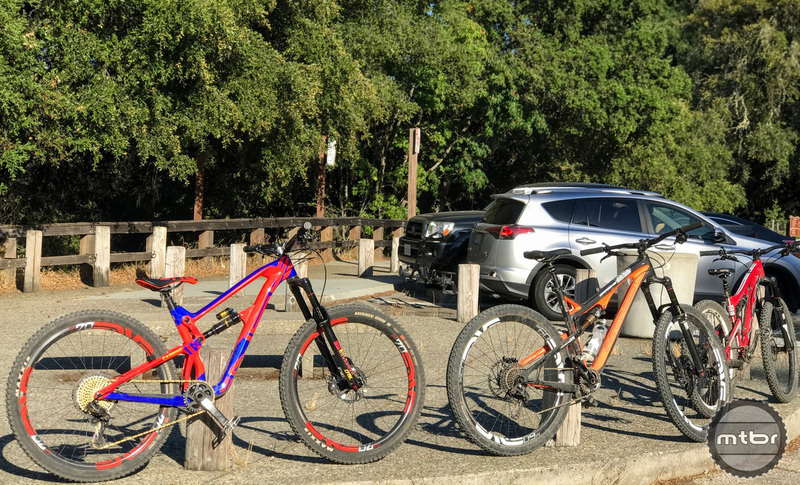 While the $10k bike is cool and all, most of use still find the $4k bike too expensive, but at least more in line with 98% of the MTB community.